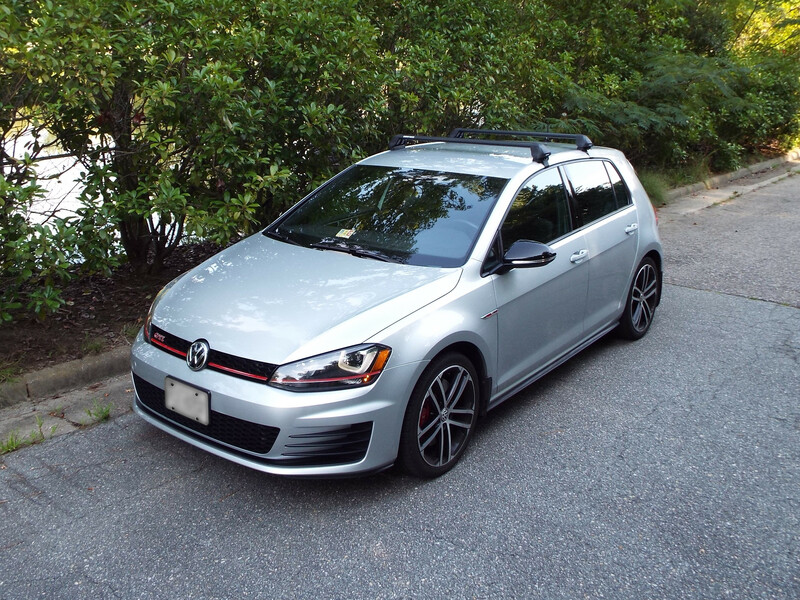 Volkswagen factory roof racks fit great, but they’re reported to be noisy, sit kind of high, and come only in silver. I wanted a style with flush, contoured crossbars for improved aerodynamics, which would also help fuel economy and noise control. I was willing to sacrifice some capacity for style and aerodynamics. 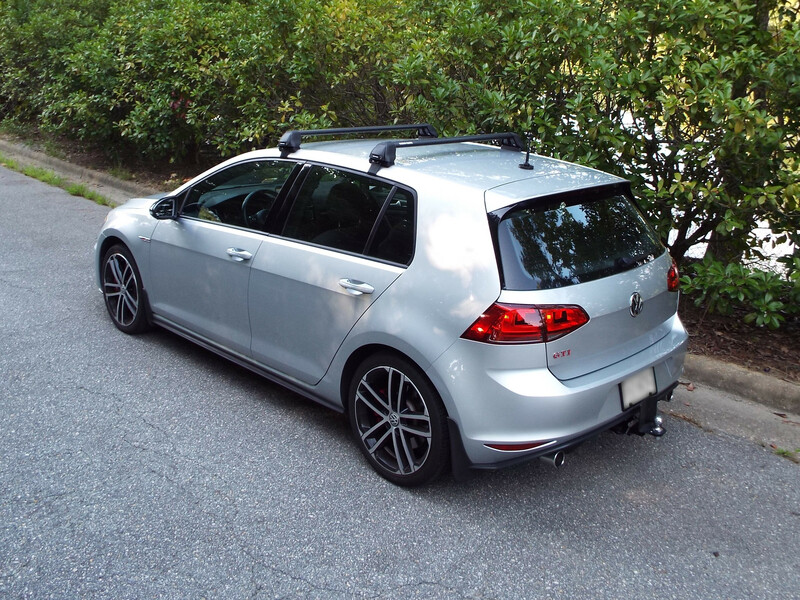 Yakima’s new “Flushbar” rack looks promising, but it’s not available for the Mk7 Golf as of this writing. Instead of another Yakima rack, opted for the Vortex 2500 RS, by Rhino Rack. It’s available in black, is low-profile, and uses a crossbar spread that matches the factory rack. However, it does not use the factory mounting points. I had done a bit of research on mounting points and crossbar spreads. 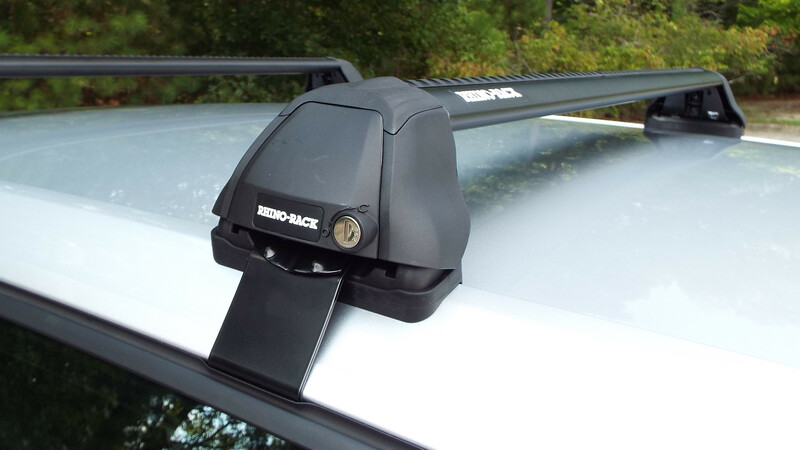 Most rack makers mimic Volkswagen’s 28-inch crossbar spread (±½”). However, I have no idea how each aftermarket company chose their mounting locations. I suspect it has to do with their selection of adaptive footpads and where they best match the contours of each car’s “gutter” and door jambs. The factory points are equidistant from the B-pillars and are marked very well in the door frame. The front mounting points center 10 inches from the top of the windshield. 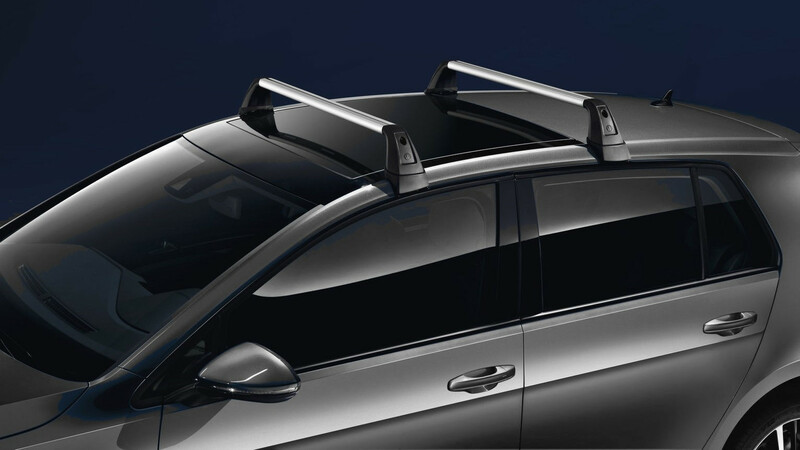 Thule, who’s rumored to make Volkswagen’s racks, centers their front crossbar at 9 inches; Yakima and Rola each center their front crossbars at just seven inches; and Rhino Rack centers theirs at a whopping 14 inches. Each company swears their location is highly researched, stable, and ideal. So does it really matter?! For the record, I feel that Rhino Rack’s footpads fit better at 16 inches, or two inches aft of what they prescribe. My main goal with regards to crossbar placement was to ensure that my ShowCase cargo box would be able to swap directly between the car top and the trailer without adjustment. The ShowCase has a pretty wide adjustment range, which allows it to fit on both long and short rooftops. I had intentionally positioned the racks forward on the trailer to avoid having any cargo protrude past the tailgate. Coincidentally, the same configuration is perfect for the car, too. The ShowCase is not even close to impacting the hatchback, but still sits back far enough to reduce the aerodynamic “block” above the windshield. The only drawback is that I must swap to a tiny, single-band ham radio antenna when the cargo box is mounted. I mentioned marred paint in my opening paragraph. I don’t expect to leave my rack mounted for extended periods. I considered adding some 3M film to where the footpads contact the paint. However, I’m much more attentive to wax and paint cleanliness than I was 20 years ago. I wash the car immediately prior to mounting the roof rack, then I remove the rack as soon as I’m done using it. I don’t use my rack as a fashion statement, so it’s only mounted for as long as I need it, which usually is less than a week at a time, often just a day or two, and hardly more than a few weeks out of the year. I also mentioned noise, aerodynamics, and fuel economy above. I’m an analytical type who wants to know “how much noise” and “how much fuel economy” each option provides. So, I did some testing! The noise test was first since it is easiest and fastest to do. I could see that my level of detail was going to make this entry longer than I prefer. So I’ve shared details on my full round of testing in this entry. 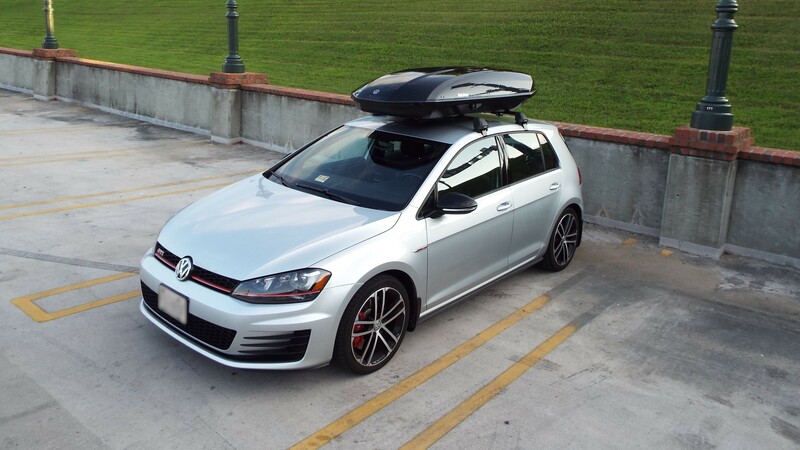 I was pleasantly surprised to hear almost no difference with the roof rack mounted. I can hear a change in sound, but there is no measurable difference in sound levels; there certainly isn’t any howling, as I had on an old round-bar setup. At 70 mph, I can hear what sounds like mild crosswinds. This effect increases at 80 mph. But, to be honest, the noise is barely perceivable over the tires on concrete roads, the ventilation set to medium-high, or with music at moderate volume. Adding the ShowCase to the roof obviously increases noise, but it’s not as bad as I expected. UPDATE: Adding a fairing INCREASED wind noise. I still prefer to transport two bicycles on my hitch carrier. 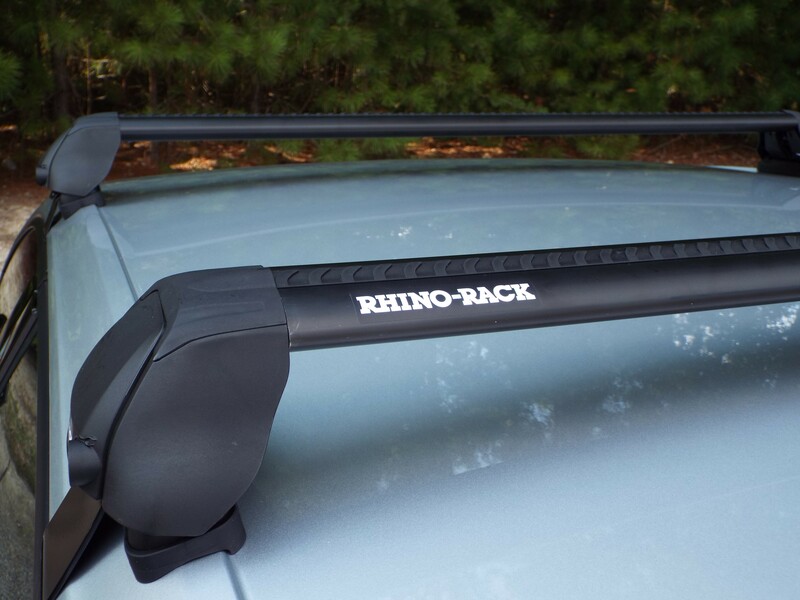 The Rhino Rack will be primarily for the ShowCase. A possible exception may be if my wife and I decide to get another tandem bicycle. We carried our previous tandem on a Yakima rack in the 1990’s and then started carrying it on the trailer rack in 1998. We’ll see what the future brings. I grew up near Houston, TX and served in the U. S. Coast Guard for over 30 years. I have an electronics background and continue to work in the electronics engineering field. I taught myself the basics about automotive systems as well as how to perform some of my own maintenance (cars and bicycles). I became involved with Amateur Radio and computers in 1995. The explosion of technology has made my job and several of my hobbies quite interesting. My hobbies include Volkswagens, bicycling, photography, electronics, amateur radio, web management, and reptiles. Visit my websites to learn more. This entry was posted in Product Review, Trailer/Cargo. Bookmark the permalink.